They might only be made from thin silicon film, but they can squeeze down hard, deliver a powerful thrust, vibrate or hold any required position. And because they can act as sensors, they are becoming important tools in technical applications. 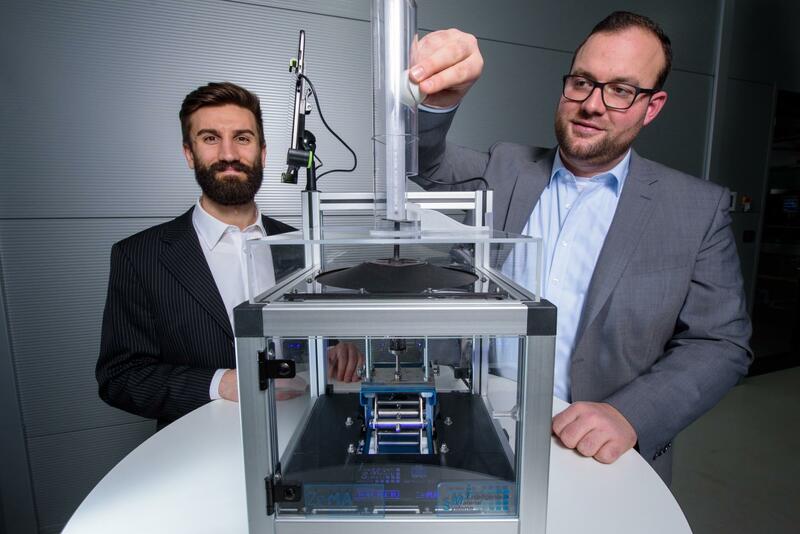 Stefan Seelecke and his team at Saarland University are developing a new generation of polymer film-based engineering components that can be used as continuous switches, self-metering valves, motorless pumps or even as tactile aids for touchscreens. The technology needs neither rare earths nor copper, it is cheap to produce and consumes very little energy and components made using it are astonishingly light. The engineering team from Saarland University is in Hannover to look for industrial partners interested in developing the new technology. The team will be showcasing the potential of their technology at Hannover Messe from the 23rd to the 27th of April at the Saarland Research and Innovation Stand (Hall 2, Stand B46) where they will be demonstrating how these electroactive films respond when they come into contact with other objects. Equipped only with a variable electrical voltage, researchers at Saarland University can not only make an ultrathin silicon film change shape – compressing it in one direction while it expands in the other, they can also get it to perform complex choreographies – from high-frequency oscillations to continuously variable flexing motions. Films with these properties have the potential to be used as novel drives and actuators. 'The two sides of a polymer membrane are coated with an electrically conducting layer. This enables us to apply a voltage to the polymer,' explains Professor Stefan Seelecke from the Department of Intelligent Material Systems at Saarland University. Films that have been treated in this way are called 'electroactive' and these polymer systems are known as 'electroactive polymers' or 'dielectric elastomers'. If the engineers alter the applied electric field, the electrostatic attractive forces change accordingly and the film gets thinner while its area enlarges. When controlled by algorithms running in the background, this rather nondescript piece of polymer with a black coating transforms into a high-tech component that can be precisely controlled by an electric voltage. 'We use the film itself as a position sensor. The component is not just an actuator, but also has sensory properties,' says Stefan Seelecke. The research team can very precisely assign changes in the position of the film to changes in the film's capacitance. 'Measuring the capacitance of this dielectric elastomer allows us to infer the mechanical deformation of the film,' explains Philipp Linnebach, a research assistant working on the new film-based drive systems and studying for a doctoral degree in Seelecke's team. This allows specific motion sequences to be calculated precisely and programmed in a control unit. Seelecke's research team at Saarland University and at the Center for Mechatronics and Automation Technology (ZeMA) is developing the film in order to produce a wide variety of engineering components. Examples include a precision self-metering valve that operates without needing to be driven by compressed air or liquids, pump drives that do not require a conventional motor, or buttons for switching things on or off. 'These components are highly energy-efficient and the film does not require any energy in order to maintain a specific position. It only needs energy when it changes its position,' explains doctoral research student Paul Motzki, who is also a research assistant in Prof. Seelecke's group. When used as a pneumatic valve, the energy efficiency is about 500 times greater than that of a conventional solenoid valve. To showcase their technology at Hannover Messe, the engineers have come up with a playful way of demonstrating its capabilities. If a ball falls onto the film, the film can measure the extent to which it has been deformed. The film not only provides information about the height from which the ball fell and its acceleration, it also fires the ball back.